Suddenly there seems to be a renewed surge of "gay pride" arising, thanks to the horrific terrorist act in Orlando. "Gay pride" parades have sprung up everywhere since then - and there seems to be no end to them. It's truly sad that a group of people who are going straight into the Face of God and who have won their battle to be "accepted" in our lost and fallen world as "normal" continue to not only push their agenda, but it seems they are all raving megalomaniacs who have seized the spotlight and wish to use it to destroy whatever is left of the world that ADONAI envisioned. 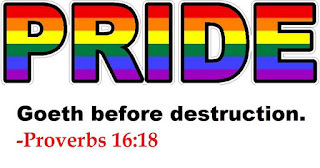 The bottom line is, Sodom and Gomorrah were destroyed, in part, because of the rampant homosexuality (Genesis 13:13, Genesis 18:20, Genesis 19:1-17) - and while ADONAI promised to never destroy the world by flood again, we ARE told it would be destroyed by fire (2 Peter 3:10). Judging by everything that is going on around the world, we can know that this "fire" isn't far off. The thing is, Scripture warns us that homosexuality/lesbianism is an abomination to our HOLY CREATOR! We were all born with the tendency to sin, yet most of us do not boast or call attention to our transgressions. None of us claim "pride" while calling attention to our respective sins, such as abortions, stealing, domestic violence, murder, adultery, etc. But, homosexuals and lesbians are flaunting their evil behavior unabashedly. They are SHAMELESS! Their sin is not worse than any other but their pride is utterly revolting to our HOLY CREATOR! Shame on them and everyone who sits around condoning this horrific sin against our Creator! The Books of Daniel and Revelation are literally unfolding before our eyes, and come Judgment Day, the "gay pride" celebrations will come to a screeching halt and these sinners whose perversions served as the proverbial "straw that broke the camel's back" will KNOW, beyond a shadow of a doubt, the huge mistake they made. 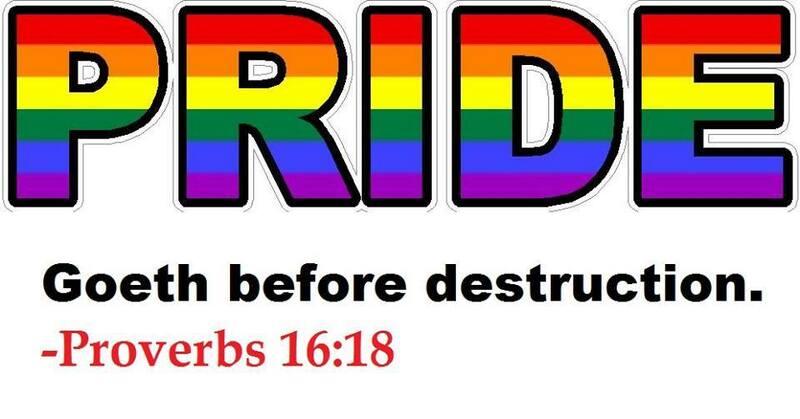 The thing is, Scripture warns us that homosexuality/lesbianism is an abomination to our HOLY CREATOR! We were all born with the tendency to sin, yet most of us do not boast or call attention to our transgressions. None of us claim "pride" while calling attention to our respective sins, such as abortions, stealing, domestic violence, murder, adultery, etc. But, homosexuals and lesbians are flaunting their evil behavior unabashedly. They are SHAMELESS! Their sin is not worse than any other but their pride is utterly revolting to our HOLY CREATOR! Shame on them and everyone who sits around condoning this horrific sin against our Creator. Shali, I too believe the judgement by fire is not far off. I believe YHWH in His Sovereignty is using everything out there (terrorist acts, natural disasters, etc.) to get us to open up to Him. This same Facebook friend of ours wrote: Yes, Missler confimed my thoughts. As a collective political nation, we have sinned away our day of grace. Jonathan Cahn said when the supremes allowed for gay marriage, that was an incredible line to cross and he didn't see how God would withhold His judgment. I do know that in Congress and in D.C. there are godly men and women who are regularly meeting for prayer and calling upon God. However, the tide of evil has become so ferocious, and our society seems hell-bent on rebellion and self destruction. I sense very strongly that our Father has His eye on those who belong to Him. Clinging to Him presents a new urgency now, but we have great confidence. "God raised us up with Christ and seated us with Him in the heavenly realms in Christ Jesus," (Eph. 2:6). Our seats are reserved, YHWH be praised.